My Beauty Diary: What's in my bag? 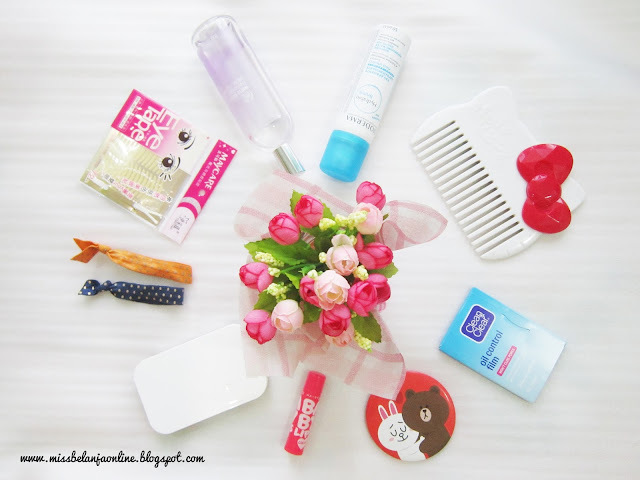 Hello, today I want to share about some beauty products that I always bring inside my bag. Actually I don't use make up for my daily activities. But, sometimes I have a meeting / event after office hour, so I need tidy myself and put a little make up to make my face look more fresh. My recent addition. This is really help to make my face feel more fresh during the day. I have a very thick hair, so I always prefer a comb with wide teeth. Bought this in Korea just because I think I need to buy something from Line Store wkwkwkwk. My favourite lip balm now comes with color. Yay! this is a boost for my pale skin and a big help for my dry lips. This is my current favourite powder. It has a nice coverage and it also can be works as a foundation. Usually I will wet the sponge with little water and tap it on the powder. Life saver for bad hair day. I used it daily and always stored it in my bag in case I need to replace mine with a new one. I love the scent so much. It is soft and I think it is suits with any occassions.